From Edmonton to Vienna, Randall MacDonald teaches you how to party like it’s 1899. As a former ballroom dancer, my mother instilled in me a love of everything glamorous and elegant. I loved the images from old movies of couples swirling in palatial ballrooms in long gowns and finery. For those looking for European glamour and elegance without having to board a plane, the Strauss Ball is alive and will in our city. The annual ball draws about 300 people and takes place at the Crowne Plaza Chateau Lacombe hotel every February. Regular tickets for the 2011 event cost partygoers $225 each. The ball was first held in 1975 and is based on the traditions of the balls in Vienna. And, it serves as a society which grants scholarships to students in advanced musical studies to further their classical training at institutions in Austria. But, the ball just whets the appetite for more. And that means leaving the city for the palaces of Europe and Asia. We love to travel and I’m an organizer, so enjoy taking on the role of travel concierge. It’s a great kick to plan the smallest detail from where we are having cocktails, what restaurants must we dine at to sites that must be seen. After we have decided on our itinerary, the next task is inviting the right friends to come along. Like planning a party, it’s important to have people with you who you not only like, but who travel in a similar style and would completely enjoy what ever adventures are planned and want to play. We will often invite, not only friends who live in Edmonton, but often friends from across Canada, the United States and Europe. Carnival takes place right before Lent. The population of Venice is usually about 270,000 but during carnival, around 1 million people stay in the city. 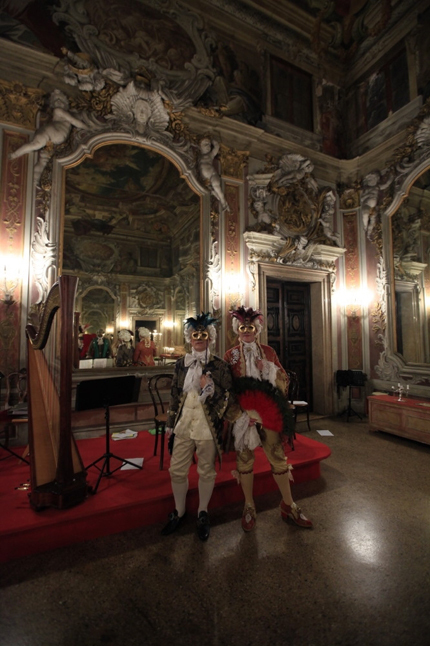 Many balls are held every evening in historic palazzos with couples donning powdered wigs and wearing lavish 18th-century costumes. If you want the full luxury experience you can stay at one of the city’s great historic hotels; the Hotel Danieli or, our favourite, the Luna Hotel Baglioni which is quite literally steps from the famed city centre, the Piazza San Marco. Both hotels will run you around $650 per night. Men in heels, woman in panniers, heavy brocades, silks and jewels adorn the revellers gliding through the alleyways and darkened salons of Venice. Venice Tourism’s website has a full listing of Carnival events. It is possible to rent costumes there, but a local designer made sure the Edmontonians going to the ball reflected their personalities and helped build excitement for the trip. Betty Kolodziej is a local costumer designer who learned her sewing skills and love of design from her mother. She has designed for local theatre groups for the past 30 years and worked to outfit the Kompany dance troupe. She has designed for Keyano College, Company Theatre and Opera Nuova. Kolodziej designed the romantic mid-19th century outfits my partner Darcy and I had worn at our commitment ceremony. “I just love the elaborate designs of decades past,” she says. These outfits consist of mid-thigh black brocade coats with high collars, white and gold long vest and ascots of satin and lace. She also has a unique connection to the Strauss Ball; she received the Strauss Scholarship in 1978, the year in which Maria von Trapp, immortalized in The Sound of Music, had also been in attendance. On Dec. 11, 1877, the Opera Ball took place for the first time at the State Opera House and has run virtually uninterrupted ever since as the society event of the year. Retaining the splendour and excitement of the age of Strauss, this ball begins with a lavish opening ceremony featuring honoured dignitaries, costumed dancers and, of course, the presentation of the debutantes, a great honour for any family of society. This ball remains the one to attend for the who’s who from around the world. However, getting tickets is no easy task. The Vienna State Opera will only accept applications one year in advance and organizers will inform you in writing several months afterward if you are successful in obtaining tickets. Tickets range from 230 Euros per person just to walk in the door to about 17,000 Euros for a box. The ball begins at 10 p.m. and does not include a dinner. However, several of the fine hotels close to the Opera, including the Hotel Sacher and the Hotel Bristol, offer lovely four course dinners with wine pairings for 350 Euros/person prior to the ball. You can stay in either of these wonderful properties starting at $400 per night. Auntie Mame said, “Life is a banquet and most poor suckers are starving to death.” Combining the events in Edmonton with travel adventures and then bringing the party back home makes life a full canvas. Mom would surely approve.